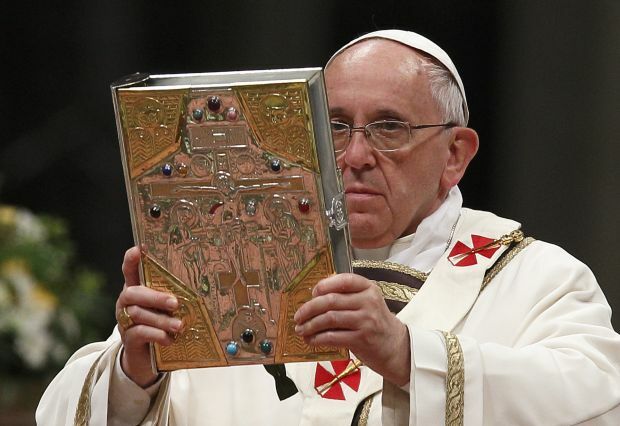 VATICAN CITY (CNS) — Trusting that people took his Lenten advice and either downloaded a Bible app or bought a pocket-sized edition of the Gospels, Pope Francis encouraged Christians to re-read the accounts of the Resurrection during Easter week. “Remember this week to pick up the Gospels, find the chapters about the Resurrection and read them — a passage from those chapters each day. This would do us good,” the pope said April 21, Easter Monday. At midday on the Italian holiday, the pope led the recitation of the “Regina Coeli,” the Marian prayer used from Easter to Pentecost. With thousands of visitors gathered in St. Peter’s Square, Pope Francis stood in the window of the papal apartment he chose not to live in and urged those in the square to let their Easter joy be evident in the way they think and interact with others. “Let us allow the joyful awe of Easter Sunday radiate in our thoughts, gazes, attitudes, gestures and words,” he said before leading the prayer. Telling the crowd that they could wish each other Happy Easter all week long, “as if it were just one day, the great day the Lord has made,” he said Christians can learn Easter joy from Mary and the other women who mourned Jesus’ death and were transformed with joy at his rising from the dead. “Think of the joy of Mary, the mother of Jesus,” he said. “Just as her pain was intimate — so much that her soul was pierced — so, too, her joy was intimate and profound and the disciples could draw from it” like drawing water from a spring.